"Portland, Maine: Caldwell Square Memorial"
IN MEMORY OF THE WORLD WAR VETERANS 1914 - 1918 PRESENTED TO THE CITY OF PORTLAND BY THE RALPH D. CALDWELL POST NO. 129 AMERICAN LEGION NOVEMBER 11TH, 1923. The monument is a stone with a bronze plaque on one face. It stands upright resting on the ground. It is roughly three feet tall. The stone is vaguely triangular with flat faces on either side. On the side facing the street there is a rectangular bronze plaque with text. It stands in a manicured circle of dirt with flowers and flags stuck in the ground beneath it. There are bushes on either side of the stone. 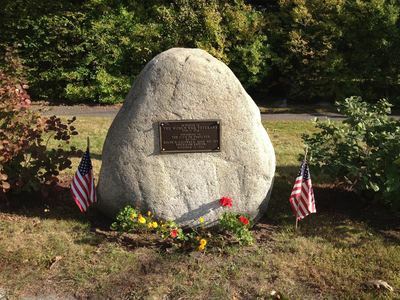 "Portland, Maine: Caldwell Square Memorial" (2015). Cumberland. 1.